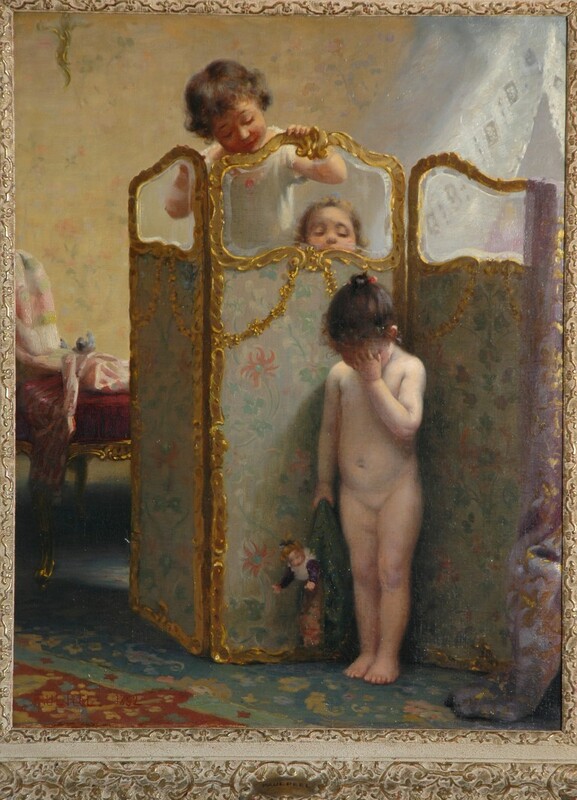 Completed the year Paul Peel died of influenza (likely brought on by overwork), In Disgrace finds Peel again using children as his principal subjects, an approach that earned him accolades with such paintings as After the Bath and The Modest Model. Moreover, with this work, Peel again demonstrates his facility at painting nudes. Thomas Eakins had initially schooled Peel in this art during his studies in Philadelphia, and Peel’s instructors in Paris had continued to instill in him the importance of mastering the human form. Peel’s decision to paint nudes in fact distinguished him from his Canadian contemporaries, who at the time found sufficient inspiration in the traditions of landscape painting, history painting and portraiture. Peel’s attention to the richly decorative screen and carpet—both enhanced by the diffuse light—firmly situates the painting in a bourgeois setting. With In Disgrace, Peel works within a sentimental tradition that confirms rather than challenges late 19th-century popular tastes.